Manufacturer of self-adhesive films for over 40 years, NOVACEL is an international expert in surface protection and industrial lamination machines. we keep it that way ! The ForGlass range gathers several films dedicated for the protection of glass from insulating glazing to acid etched glass. Usually speaking, protection of the glass is a concern for professionals of the industrials dealing with glass. Glass may be damaged all along the value chain and especially during transportation. Forglass range, strong of Novacel’s experience in the design of temporary protective films, offers solutions to a wide range of glass. Each glass professional will find the best solution to his need in the Forglass range ! 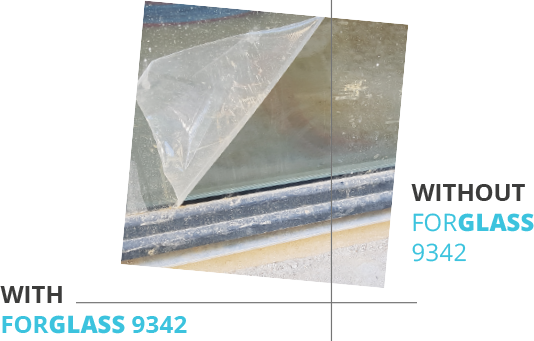 With 6 month worldwide outdoor guaranty, Forglass 9342 is perfect to protect insulated glazing from dirt during the construction site. Beef up your mirrors with Forglass 9212 ! The best permanent anti-shatter film for the back of mirrors and lacquered glass ! Let's protect your sensitive coated glass with Forglass 4201 ! You will find in Forglass range your best ally to secure the sensitive etching operation! Any questions ? Want to see and try the NOVACEL® FORGLASS range ?